The Body Shop is giving away P150,000 CASH & 15 fabulous prizes on its 15th Year of Natural Beauty! 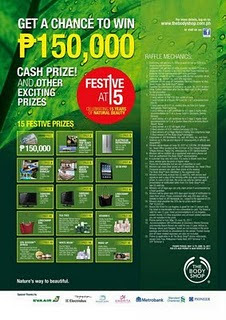 Get one (1) raffle coupon for every purchase of P500 on any of our products. LYB MEMBERS GET TWO (2) RAFFLE COUPONS FOR EVERY P500! JUST SHOW YOUR CARD TO GET DOUBLE CHANCES OF WINNING! 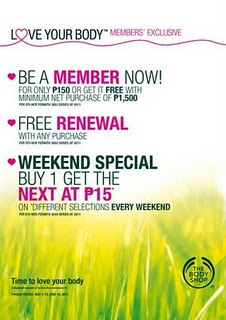 Promo runs from MAY 15 to JUNE 16, 2011. Per DTI NCR Permit No. 3649 Series of 2011. 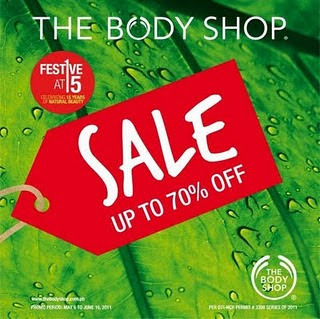 Love Your Body Exclusive Promos from May 6 to June 16,2011.So what are you waiting for visit your nearest The Body Shop store and be member to grab the exclusives promos from your loving The Body Shop!! Love Your Body is a unique members club that rewards you with discounts, free gifts and access to the kinds of perks and privileges only club membership brings. Just some of the reasons to join Love Your Body. Love Your Body is not a store credit card. It doesn't use complicated point systems. It won't make you spend more on product you didn't need in the first place. Love Your Body gives you immediate and real benefits - and you'll experience them every time you use your card.